Home costume makeup Weekend Catchup and Thundercats! We were the Thundercats! Do you guys remember the popular cartoon from the '80s? 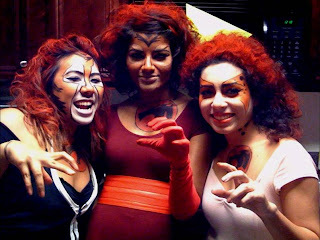 I think we were Tigra, Liono, and Cheetrah? Something like that, lol. So the crazy thing about all of this was that we didn't have any costumes or wigs or anything. Instead we had to be creative with it. I sent the BF to the store to pick up some Halloween red hair dye, the kind you spray on. We donned leotards, tights and boots, big teased hair and then I did the makeup. 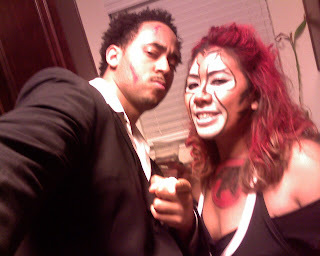 I free handed the thundercats logo on our chests just in case you couldn't tell what we were, lol. Can you believe we did all of it in 2 hours? LOL it was crazy in my little apartment! I wish I got a more clear picture but this is the best we could get with a camera phone! My friend's fiancee went as Tyrone Biggums, the crackhead from the Dave Chapelle show. My boyfriend went as Tony Montana, aka Scarface. Good times! In case you're wondering how I got Tyrone's lips to stay white looking...I used MAC cream colour base in white and a little baby powder. On the BF I painted on some blood using Ben Nye cream colour in red, MAC multipurpose gloss and a little brown eyeshadow. Too bad you can't really see it well though because these pics were taken on an I-Phone. I guess my BF went as the black version of Tony Montana...I told him we should have flat ironed his hair to make a little swoop in the front, lol. We only stayed at the party for 1.5 hours cuz it was so far, lol. But I was glad we dressed up. Sunday we slept in and I had two makeovers for a birthday party later that afternoon. They turned out great! I'll post pictures soon. Another blurry camera phone pic of me and the BF. How was your weekend guys? What did yall do? Hi there-you all look fantastic-very creative indeed! great job on the crackhead..lol and the other makeup. You and your bf are a totally cute couple. des fauves sauvages! Bravo pour tes superbes maquillages! woot thundercats!!! gotta love t parties! thundercats...hooooo! I used to love that show :) awesome job on the makeup ren! awesome makeup girl!! Not bad for last minute huh!! I like the tyrone one from dave chappelle..sooo funny!! Since you are a makeup artist, I was wondering if you use primers (eye, eyelash, face or lips) on yourself/your clients. Are they really as amazing as they are described to be, or does a moisturizer do the same job? Thank you! Oh my goodness! Thundercats was THE cartoon. Me and my ROTC crew used to run, not walk, to one of our leader's house to make sure we caught every episode after afternoon drill practice. Thundercats....hoooo!!! Awesome with the makeup. The guys were pervs....they loved Cheetara.